Not too long ago we had an opportunity to go outdoors and roast marshmallows with some friends. As one of the many Basic Living enthusiasts, I took the opportunity to take some of our products out to see how effective they are (or how effective they are not). Here are the products I decided to take with me and tested in real outdoor situation and my thoughts on them. The Folding Stove by Emergency Zone is a very compact, light weight stove with very capable solid fuel tablets. They used to come with 8 large square tablets in the past, but the newer ones come with 24 smaller tablets (the image shows the older square tablets broken up into pieces). These solid fuel tablets will burn for about 5 to 7 minutes depending on its size. It is a bit difficult to light because you actually need a flame to get the fuel tablet to start burning. Once lit, they produce hot flames capable of boiling water and cooking a hot meal. You either want a match or a lighter to light one of these though. 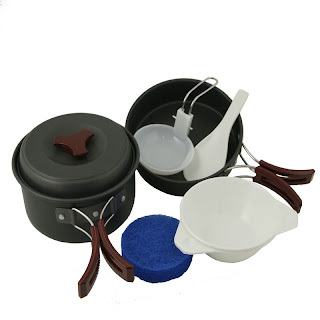 Having a lid is a huge plus in outdoor cooking when you have very limited amount of fuel. The lid is a big plus in outdoor cooking. It allows the food to cook faster without wasting heat produced from precious fuel. This is definitely one of my favorite products. The folding saw by Emergency Zone was another fun and effective tool. In order to start a camp fire, we needed some wood to burn. 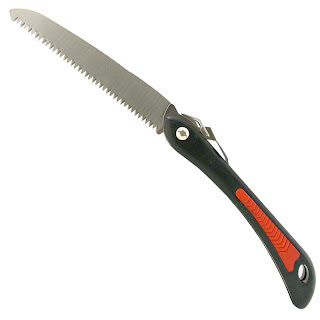 I handed the saw to a friend of mine and they were back in no time with plenty of wood for roasting marshmallows. Hot ramen noodles were perfect for us on a chilly evening to warm up. 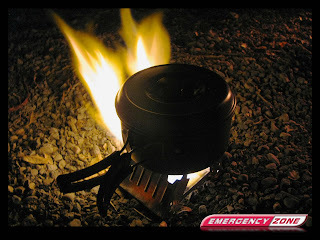 I can see how beneficial it would be to have the option to cook a hot meal in a survival situation. It is said that eating a hot meal will help calm the mind in disaster survival/stressful situations. It is also a great option to have when you need to obtain drinking water if you do not have water purification tablets or filters. Boiling is one of the many effective ways to obtain safe drinking water in survival as well. After having used them in an outdoor situation, I give these three products the following ratings (I am biased though). Awesome post. Most informative. Thx! , I have actually read a lot of your blog posts in the last hour. I really enjoy what you are doing here. (And as a writer of fantasy novels, I'm enjoying looking at different aspects of that when you go through them in blogposts). And truly, I love world-culture building.